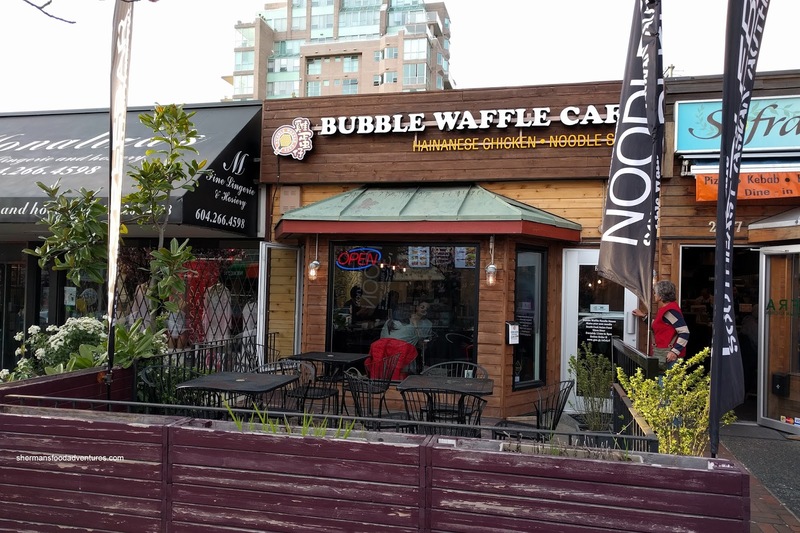 For those who love bubble waffles, it is safe to say that Bubble Waffle Cafe makes a respectable version. That is essentially what put them on the map with their original location at Aberdeen Centre. A bustling food stall that not only serves up freshly made bubble waffles, but also a good bang-for-your-buck customizable noodle soups and other various snacks as well as bubble teas. 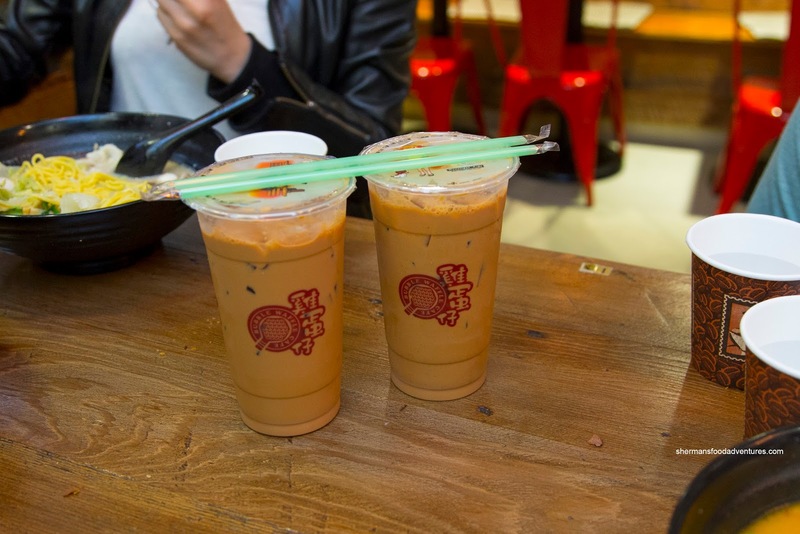 Now they have expanded not only into Crystal Mall's food court, but they also have stand alone stores located in Killarney, UBC and in Kerrisdale. I, along with the ChineseBites crew were invited for a visit to the Kerrisdale location. 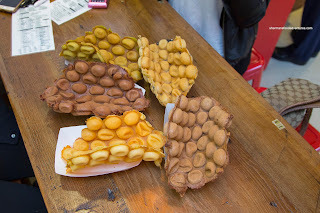 To get things going, we were served their signature items - Bubble Waffles. Not sure if this was an appie or dessert though... From bottom left clockwise, we had the Original, Chocolate, Matcha, Oreo and Cinnamon. Call me boring, but I liked the original the best since it was mildly sweet with a certain aromaticness. It was crispy on the outside while appealingly chewy on the inside. As interesting as the cinnamon waffle seemed to be, the flavour didn't really work for me. It almost seemed like it needed more sugar for balance. The other waffle worth noting was the Oreo as it was pretty sweet due to the main ingredient. However, there wasn't too much of it to make it crazy sweet. Next, we were served some snacks including Taiwanese Sausage, Takoyaki, Fish Mousse Sui Mai and Stinky Tofu. Served on skewers, the sausage was sweet and meaty with a touch of greasiness. The exterior casing exhibited a nice snap. Other than that, it was wasn't overly memorable. On the other hand, the takoyaki was actually decent. The outside was lightly crispy while the inside was fluffy encasing a small pieces of octopus. I've never been a fan of the fish sui mai as it can be rather doughy and bland. This was pretty much that, except the sauce added a nice saltiness. 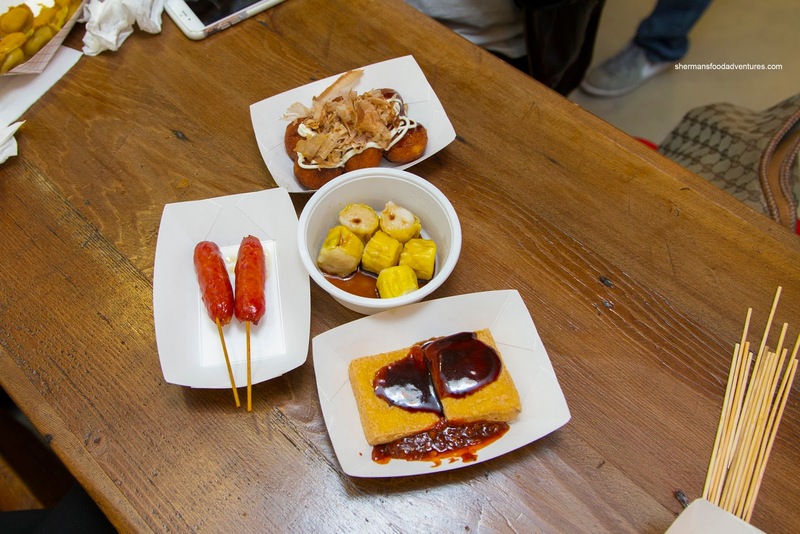 Lastly, the stinky tofu was fairly pungent, but not as stinky as other versions I've had in the past. 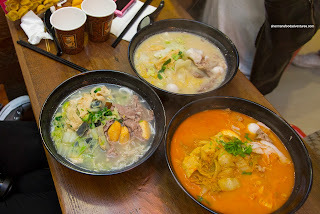 Their other items they are known for is their aforementioned build-your-own soup noodles. At our table, we had the Cilantro and Century Egg Soup, Original and Malay Laksa. For me, the most surprising soup was the century egg as it was aromatic and clean-tasting. The rice noodles were nicely chewy while the sliced beef was tender. Their original fish soup was pretty decent with the natural sweetness of fish and the cloudiness from the boiling of the fish bones. For me, I selected the laksa with oil noodles, tripe and brisket. 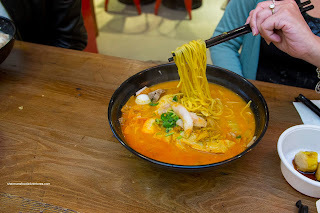 Okay, let me get this out-of-the-way first, this was not an authentic laksa (and really, who was expecting it anyways). However, with that being said, it was decent with some creaminess accented by a considerable amount of spice and sweetness. Of course we also had some Milk Tea which we requested at 1/4 sweet. As such, I could taste the tea, but it could've been stronger. Furthermore, I would've liked to see more milk as the drink wasn't that rich. But once again, there was nothing inherently wrong with the bevvies. This could be the theme of the place as all of their offerings are definitely acceptable with little fanfare. Nothing particularly stands out (other than the original bubble waffle), yet at the same time, nothing really offends either. Hence, the place can be counted on for a reliable and inexpensive quick meal.